The Sunshine State is known for many things, such as the stunning beaches that extend for miles on the east and west coast. This beautiful environment attracts not only tourists from around the world, but it also provides the perfect conditions for bee and wasp colonies. At Palm Coast Pest Control, we understand that having a bee or wasp infestation on your Florida property not only puts a damper on your outdoor plans, but that it can also be dangerous. If you have swarms of these troublesome insects around your residential or commercial property, contact us right away for a free estimate. Bumblebee. This species is very large, featuring distinct yellow and black stripes with a fuzzy abdomen. Often nests in colonies underground or in landscaping debris. Honeybee. Measuring about 15 millimeters long, these bees are oval-shaped and light golden brown in color. They nest in large colonies in tree hollows and rock crevices. These bees can sting only one time. Yellowjacket. This wasp is approximately 12 millimeters long with alternating black and yellow stripes on its abdomen. They are very aggressive when defending their nest and may sting multiple times. Cicada killer. Growing as big as 1.5 inches, this wasp has a black body with pale yellow markings. It nests alone and is known for stinging and paralyzing cicadas. Cicada killers will rarely sting humans unless provoked. Mud dauber. 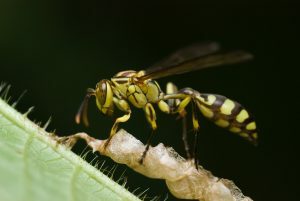 About 1 inch in length, these wasps are usually all black and feature a long, thin waist. They are known for their mud nests, are not aggressive, and rarely sting humans. Paper wasp. Measuring approximately 20 millimeters long, paper wasps are brown in color with red or yellow markings. They are known for their papery nests, are very aggressive. If you see any of these bees or wasps on your east or west coast Florida property, contact Palm Coast Pest Control right away! Our team of highly trained professionals has the skill and tools to perform safe, effective wasp and bee removal. Call us today at 800-819-7378 or request a free estimate for our extermination services online now!